Synopsis: Fifty generations ago the cultural empire of the Celts stretched from the Black Sea to Ireland and the Highlands of Scotland. In six hundred years, the Celts had produced some of the finest artistic and scientific masterpieces of the ancient world. In 58 BC, Julius Caesar marched over the Alps, bringing slavery and genocide to western Europe. Within eight years the Celts of what is now France were utterly annihilated, and in another hundred years the Romans had overrun Britain. It is astonishing how little remains of this great civilization. 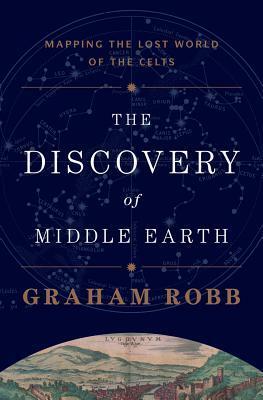 While planning a bicycling trip along the Heraklean Way, the ancient route from Portugal to the Alps, Graham Robb discovered a door to that forgotten world–a beautiful and precise pattern of towns and holy places based on astronomical and geometrical measurements: this was the three-dimensional “Middle Earth” of the Celts. As coordinates and coincidences revealed themselves across the continent, a map of the Celtic world emerged as a miraculously preserved archival document. Review: The book is made up of a Protohistory, four parts and an Epilogue. The first part is made up of five chapters, the second is made up of three chapters, the third and fourth parts are each made up of four chapters. At the end of the book there is a Works Cited section, a Notes section, a General index and a Geographical index. It also has a Chronology of the Celts. I wasn’t left wondering for long. The book was…it was…I honestly have no words. Most of the time I was reading the book (what I could stomache of it anyway) I was either rolling my eyes or thinking SOURCE!!! Don’t get me wrong his most outlandish hypotheses were explained…sort of in the notes for the chapters in the back of the book but still they were just…Can you tell I’m frustrated? This book was basically a lot of assumptions that had some basis in history but you had to make some great leaps of faith to connect them. I wish someone had plastered Unverified Personal Gnosis all over this book’s cover so I knew what this book would be instead of me thinking that it was a history book. I’m sure there are some truths in this book, but they were buried so deep in the author’s flowery words and wishful thinking that I totally missed them. I wouldn’t recommend this book to beginners, and to the more advanced readers of Celtic history? Approach with caution.